Our 2-in-1 Organic Shaving + Body Soaps are specially formulated with Organic Shea Butter & French Green Clay to give a lubricating, creamy lather for a clean & incredibly smooth shave that won't dry your skin. French Green Clay gives a closer shave by making a more "slippery" surface for your razor to glide on, while rich organic shea butter and avocado oil condition and soften the skin. Bay Spice is a fresh, sweet and lightly spicy blend of pure essential oils, reminiscent of a classic Bay Rum scent, and is our best seller. 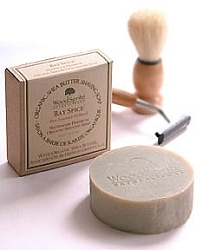 May be used by lathering with the tips of the fingers or in gentle circular patterns using a traditional mug & brush (Brush and Razor Not Included). Ingredients: Saponified *Organic Extra Virgin Olive & *Organic Coconut Oils, *Organic Shea Butter, *Organic Castor & *Organic Avocado Oils; French Green Clay (montmorillonite), Bentonite Clay & Pure Essential Oils of Bay, *Organic Sweet Orange, *Organic Lavender, Balsam Fir, Cedarwood, Clove, Sage, *Organic Lemon, Patchouli, Allspice, Cassia, Benzoin. (*Certified Organic) Handmade & Hand-Cut 3.5 oz, 3-inch diameter. Earn 12 Loyalty Points when you buy this item!